10 Biggest SEO Myths Busted! Are you stuck in your old ways and not willing to let go? Or maybe you have heard too many stories too many times and believe them to be actually true. However, the fact is, there's a lot more to SEO than meets the eye - and less. 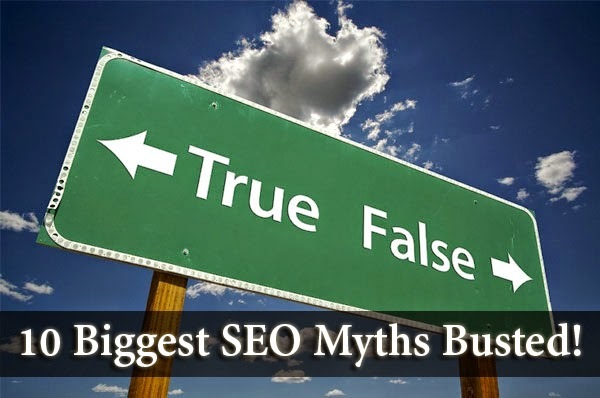 Here are some misconceptions and myths about SEO that need to go away! If we didn't know better, we'd believe these in a heartbeat! Are you aware of these 10 SEO Myths that need to be busted? There's a myth going around that Google and other search engines favor those who buy ads. This is actually not true. There are plenty of high ranking websites that don't buy ads. No amount of ad buying will get you organically ranked higher. The instant a search engine starts determining ranking based on ads is the instant it loses credibility. Simple as that. ...since never! It's always been about a mix. SEO is fundamental, it's important and can fuel growth. But what'll it grow? You need content, social media, and a host of other things beside SEO to make your site a success. Wait, what?? I thought structured data helped! Until only recently, I had this strong misconception, and I think many of you do too. Marking up your content will help search engines gain a better understanding of your content, and allow them to use that content in unique ways in the SERPs, but installing the code for structured data doesn’t boost rankings, nor does its absence hurt them. This is probably one of the most popular myths out there. Everyone thinks their content is gold. Maybe it is, but that's not something for you to decide. Content is deemed great by your visitors and search engines, not you. All the standards in the world won’t help you if no one likes your writing style, voice or message. Never delude yourself into thinking what you produced is excellent just because you put time into it. Watch what visitors engage with and seek to follow that same pattern. While important as a vote of confidence for the content they point to, there is simply so much link spam these days that it’s tough to know where to turn. Obviously buying links is a dead end, and it doesn’t matter how you split this hair: sharing, encouraging, incentivizing, buying – it’s all the same. You want links to surprise you. You should never know in advance a link is coming, or where it’s coming from. If you do, that’s the wrong path. Links are part of the bigger picture. You want them, but you want them to be natural. If an engine sees you growing tem naturally, you’re rewarded with rankings. If they see you growing them unnaturally, you’re rewarded with penalties. Social takes time, I can’t be bothered with SEO, so I’ll just do social. There was a time when ranking a website was like making consommé. You wanted one thing – clear broth. At that time, you could focus on a single tactic and it would boost rankings. Today it’s more like trying to make the world’s best seafood chowder. Success depends on a complex mix of ingredients, freshness and timing. One ingredient alone won’t bring success, and yet without that one ingredient, you don’t have a chowder. Yes, it’s nice to rank on top, but you know that actual rankings fluctuate on a daily basis. Does the #1 spot actually get you more clicks and conversions and the # 2 or #3 spot. Depends on the phrase sometimes. And for those trying to get off page 2 of the SERP and onto page 1, be careful. Often the click through rate (CTR) of the top spots on page 2 are far better than the CTRs on the lower positions on page one. If you rank well on page 2, be careful when planning your assault on page one. Unless you can get above the fold, it might be better to stay put and own the top of the second page. All of this will, naturally, vary a great deal form site to site, page to page and even across individual phrases. Sometimes people research on one phrase and buy on another version, for example. It’s important, but even the most well-crafted title tag can’t elevate a site skipping everything else. This is a somewhat common refrain from bloggers as some of the most popular platforms don’t include things like meta descriptions in their base code. Plugins exist to easily add them, and allow access to a bunch of other common areas SEOs like to fiddle with. You should spend time getting the title right, but this alone won’t save a sinking ship. While technically a different discipline, its time more folks starting seeing them as similar. Both focus on improving a website for users. Investing in SEO and not investing in usability is like tying one sneaker and going for a run. Yeah, you’ll be OK, but wouldn’t it be a better experience with both shoes tied? Since when? People like video content, which can easy and fun to produce. Videos enrich your content, and some people base their content strategy on videos. But let's face it, embedding videos can negatively affect page load times, frustrating visitors. And a video alone won’t help rankings. You've got to give the search engines something to understand, as they’re not going to “watch” that 4 minute rant you posted. A transcript maybe.